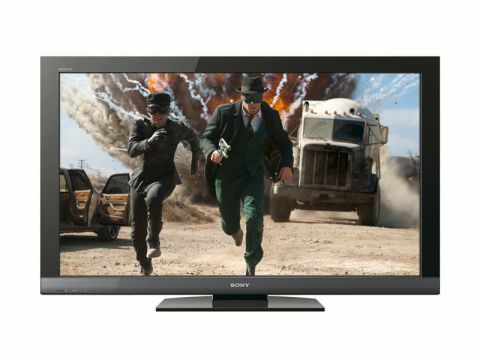 The appeal of the Sony Bravia KDL-37EX403 is obvious. It's a 37-inch TV from one of the world's most reputable AV brands that doesn't cost very much: a combination likely to have at least the more conservative end of the TV market trembling with anticipation. The 37EX403 builds on its economic appeal with a surprisingly lengthy feature list. Heading this up is the (recently expanded) Bravia Internet Video online platform and there's good support from an integrated Freeview HD tuner, a full HD resolution, optional Wi-Fi support, and the ability to play multimedia files from USB storage devices. It lacks the cool, 'Monolithic' design found higher up Sony's LCD TV range, with the bezel standing proud of the screen, rather than flush as part of a single layer and the all-black finish of the top-end models is replaced by a two-tone design. The 37EX403 is far from ugly in the context of similarly priced TVs, though. As you might guess from its price, the 37EX403 sits pretty low down Sony's current TV range as part of its Essentials Series. Stepping up to the EX503 series will give you 100Hz on top of the 37EX403's functions, while if you want similar spec but in a 'Monolithic' cabinet, you'll need an NX503 set. The NX703 series introduces edge LED lighting, the HX703s have 200Hz processing and the HX803s introduce 3D playback, while the HX903s sprinkle 400Hz on top.